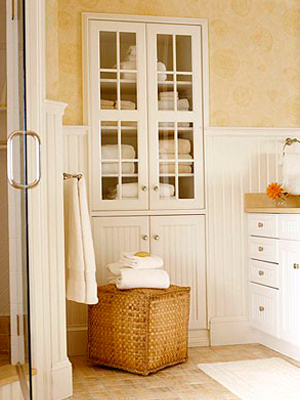 There’s no such thing as too much bathroom storage. Our blogger shares these pretty and practical ideas she found on Pinterest this week. Whether you’re remodelling or simply looking for clever tricks that will make your bathroom more functional, Pinterest is full of inspiration. Here are a few of my favourite ideas. Two elements I definitely want for my dream bathroom: a floor-to-ceiling cupboard with ample space PLUS lots of drawers and extra cabinets under the basin. I love the glass doors to show off attractive linen combined with solid doors below to hide the less attractive things that live in the bathroom. How clever are these! Privacy walls to block off the toilet from the rest of the bathroom can double up as storage space if they’re made of board rather than bricks. The one on the left has a cupboard opening to the bathroom side to store shampoos, lotions and potions. The other has the storage on the toilet side instead, providing a handy magazine rack for the loo library. 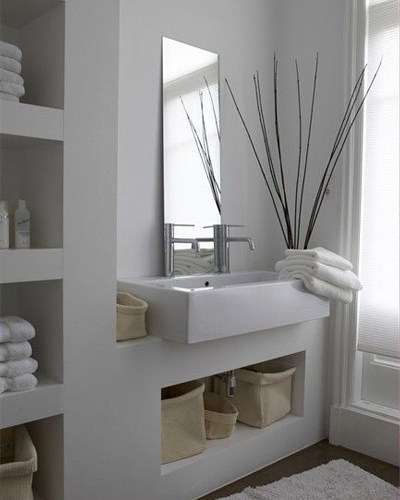 It’s so easy for small things in the bathroom to get lost in a large under-basin cabinet or clutter the basin surround. 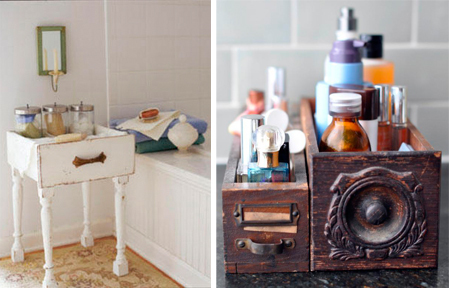 This idea borrowed from kitchen spice drawers is perfect for all the little things you need to keep close for your daily bathroom routine. 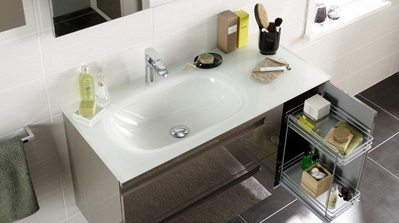 There’s often a space at the end of the bath that’s not big enough for a basin or toilet but too small for much else. It doesn’t have to go to waste. 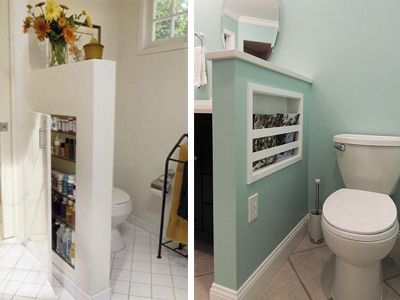 Here are two ways to get maximum use out of such a narrow space with floor-to-ceiling storage. 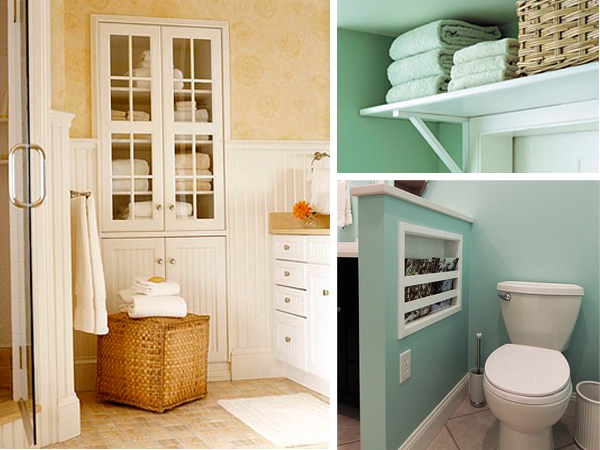 Squeeze out extra storage even from a small bathroom by adding a shelf over the door. These lovely vintage drawers have been roped in as storage for bits and bobs. The one on the left has had legs added so it’s easy to reach from the bath while the two on the right – from a hardware store cabinet and a sewing desk – have been left with all their original old-world charm. 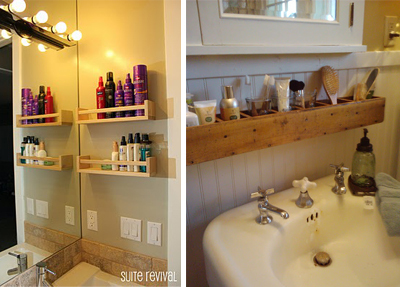 If you’re building a new bathroom or renovating an old one, here’s a neat way to incorporate open shelving into the design. Add baskets or other containers for smaller items and those you don’t want on display. Can’t find a shelf that’s quite right? Improvise! 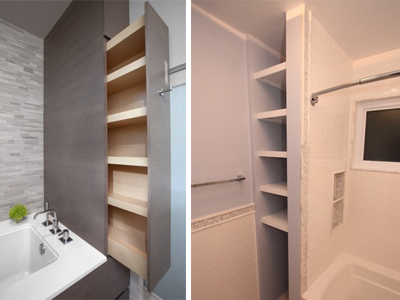 Two spice racks in the bathroom on the left hold tall, slender bottles upright. On the right is a wooden CD rack turned on its side to keep toiletries organised.